KAHsp40 associates with the PEXEL translocon on the PVM. (A, B) IFA analysis reveals that KAHsp40 and Hsp101 co-localize with each other on the PVM. (C, D) IFA analysis reveals that KAHsp40 and PTEX150 co-localize with each other on the PVM. White arrows indicate the discrete foci in which they co-localize.Acharya P, Chaubey S, Grover M, Tatu U. An Exported Heat Shock Protein 40 Associates with Pathogenesis-Related Knobs in Plasmodium falciparum Infected Erythrocytes. PLoS One. 2012;7(9):e44605. KAHsp40 is exported into the infected RBC cytosol. 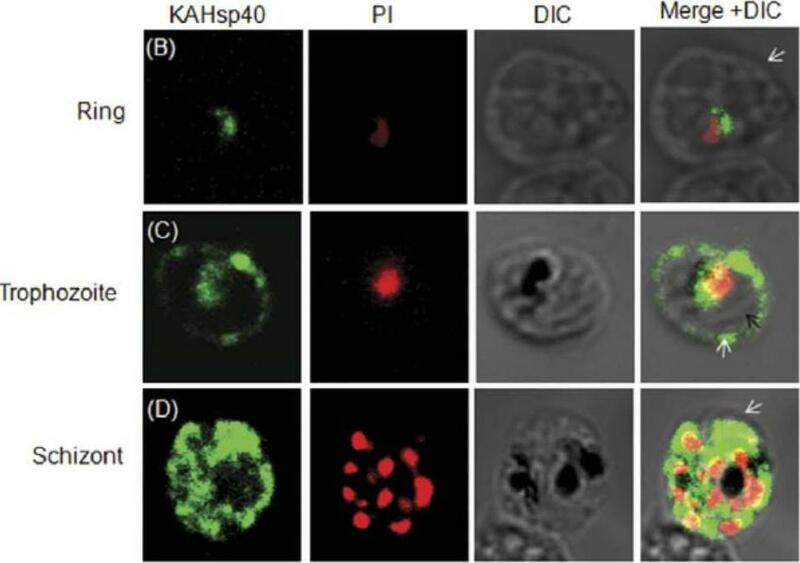 IFA of (B) ring stage parasites (C) trophozoite stage parasites (D) schizont stage parasites reveals the presence of KAHsp40 in discrete foci in the erythrocyte compartment. Black arrow indicates the parasite boundary and white arrow indicates the erythrocyte membrane.Acharya P, Chaubey S, Grover M, Tatu U. 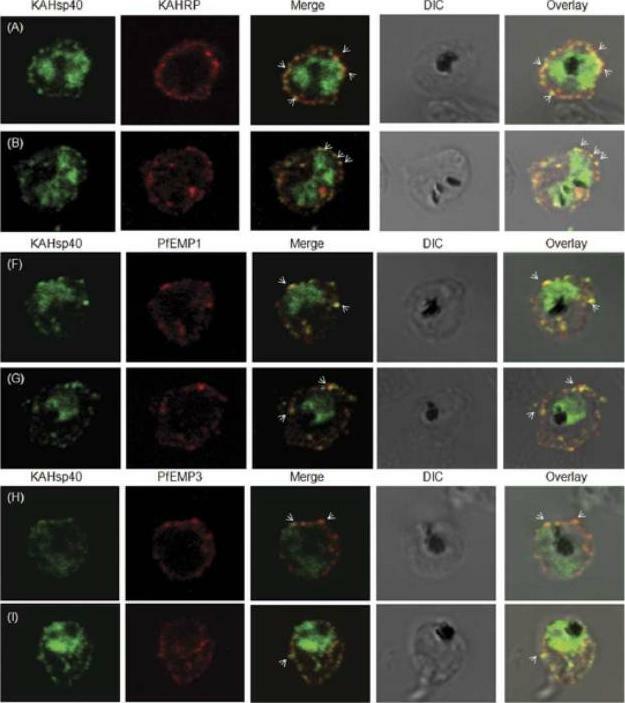 An Exported Heat Shock Protein 40 Associates with Pathogenesis-Related Knobs in Plasmodium falciparum Infected Erythrocytes. PLoS One. 2012;7(9):e44605. KAHsp40 does not associate with Maurer’s cleft. 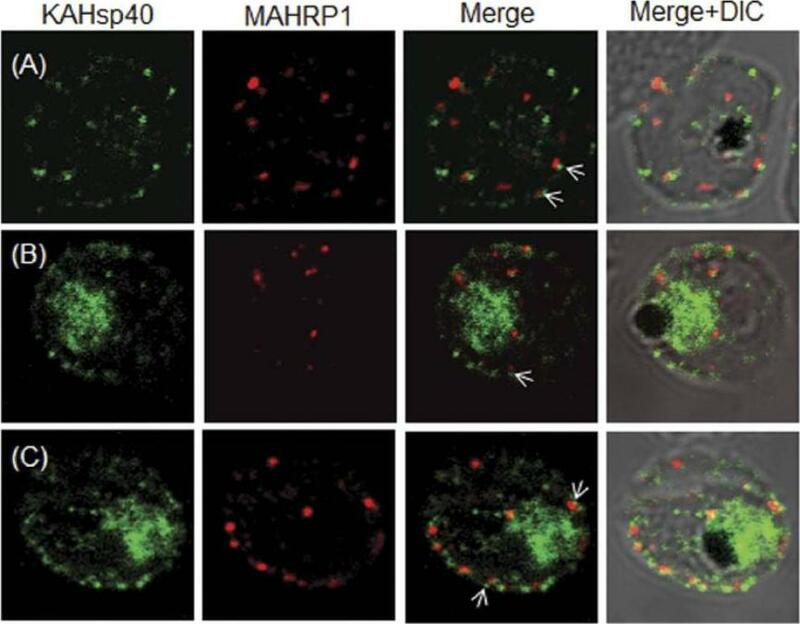 (A–C) IFA reveals that both KAHsp40 and MAHRP1 are present in discrete and different foci in the infected erythrocyte, however, they do not co-localize with each other in spite of signals being in close proximity (highlighted by white arrows). The images shown have been taken at the trophozoite stage.Acharya P, Chaubey S, Grover M, Tatu U. 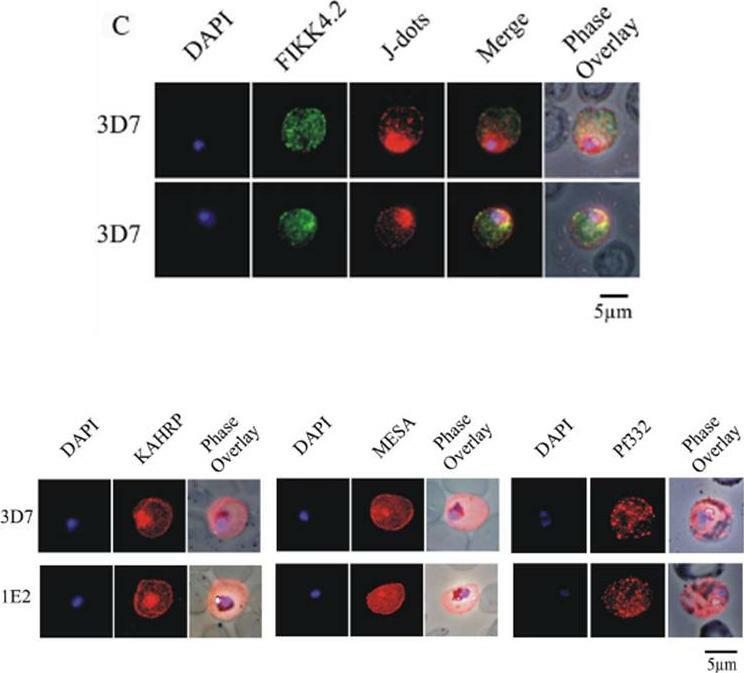 An Exported Heat Shock Protein 40 Associates with Pathogenesis-Related Knobs in Plasmodium falciparum Infected Erythrocytes. PLoS One. 2012;7(9):e44605. KAHsp40 associates with knobs on the infected erythrocyte membrane. (A-B) IFA reveals that KAHsp40 and KAHRP co-localize in the erythrocyte periphery near the erythrocyte plasma membrane. White arrows indicate the discrete foci in which they co-localize. 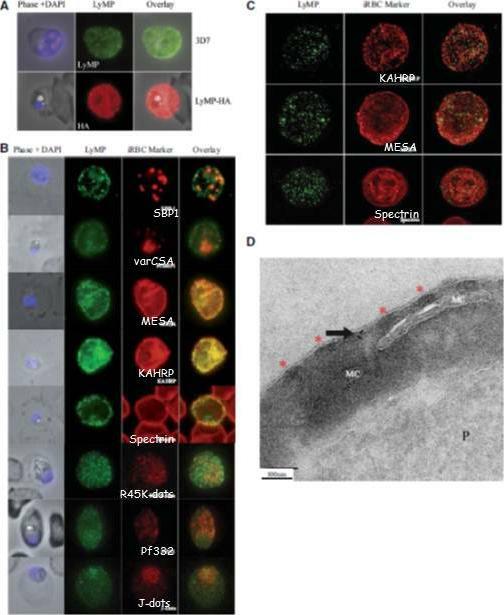 KAHsp40 and PfEMP1 and KAHsp40 and PfEMP3 co-localize with each other on the erythrocyte plasma membrane indicating the close association of KAHsp40 with knobs.Acharya P, Chaubey S, Grover M, Tatu U. 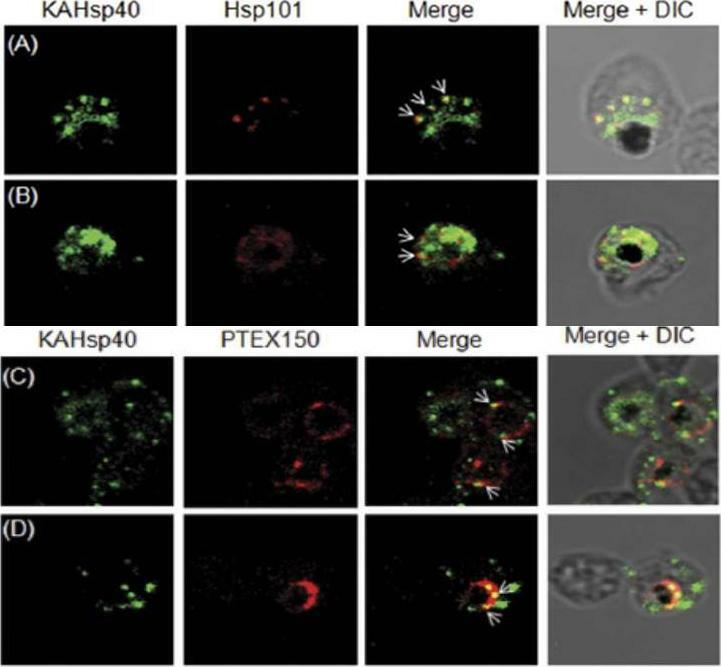 An Exported Heat Shock Protein 40 Associates with Pathogenesis-Related Knobs in Plasmodium falciparum Infected Erythrocytes. PLoS One. 2012;7(9):e44605.